Romania's castles are alluring, not only for their haunting beauty but for the legends and history that surround them. For castles that are still standing, visitors can wander through the same halls and view the same natural landscapes that the inhabitants did while picturing themselves in a different time and place. Ruined castles represent a different type of beauty: ghosts linger in crumbled towers and fallen parapets. It's up to the viewer to picture the castle intact, standing strong against sieges or providing sanctuary for influential families. Peles Castle is located near Sinaia in Romania and is known as one of Romania's most beautiful castles or palaces. Constructed at the end of the 19th and the beginning of the 20th century, Peles Castle was built for King Carol I of Romania. The castle was used by Romanian royalty until the end of the monarchy. In the early 1950s, it was transformed into a museum. Peles Castle is as luxurious inside as it is outside. Visitors to Peles Castle can view 35 of its over 150 rooms, which include an armory, the imperial suite, and other rooms sumptuously decorated and appointed with furnishings from various parts of the world. An additional fee is required for guests who wish to take photos, but bringing a camera is recommended. Bran Castle is popularly known as Dracula's Castle, though the real Dracula, Vlad Tepes, never lived in this castle. 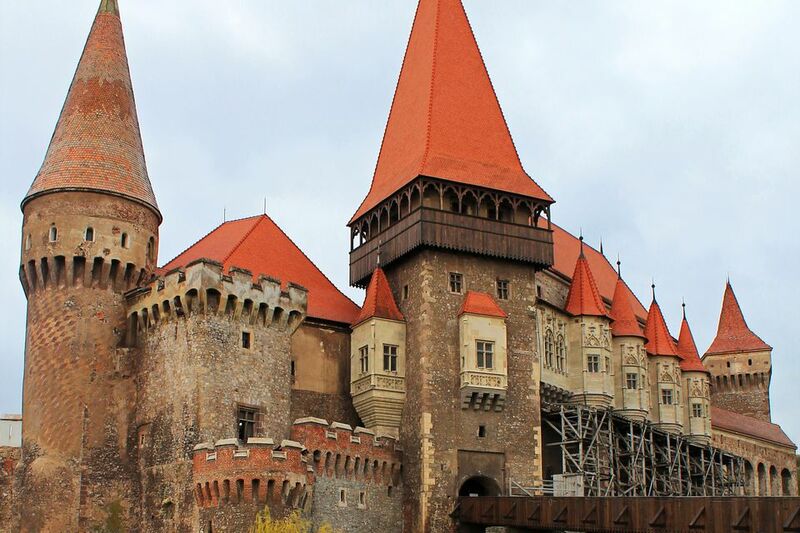 This castle is not among Romania's most beautiful castles, but its association with the most famous vampire legend makes Bran the best known, and, understandably, one of the country's most popular tourist attractions. Despite its disappointing lack of strong connection to Dracula, Bran nevertheless makes an excellent destination. Interest in Dracula has encouraged castle administrators to make Bran accessible for visitors. Bran Castle's English-language information provides directions for getting to the castle and other valuable instructions for travelers to Romania and the Brasov region. Visitors to Bran Castle will learn about what connection Bran has with Dracula, its role as a medieval fortress and royal residence, and facts about related history. Fagaras was built as a fortress in the region of Romania, and the town of Fagaras has grown up around the medieval citadel. The castle withstood sieges and attacks due to the strength of its thick brick walls and deep moat, two of the structure's most notable features. Today, Fagaras Castle is a museum of archeology and history. Eighty of its rooms are preserved, along with towers and courtyards. Due to its well-preserved state, visitors to the castle are able to envision it in use as a respected Transylvanian stronghold and military outpost. Hunedoara Castle, also known as Corvin's Castle or Hunyadi Castle, is a 14th-century Gothic-style castle complete with drawbridge and towers. It was at this castle that Vlad Dracul, the father of Vlad Tepes or Dracula, was imprisoned for several years. It gets its name from the Hunyadi family, who owned the structure. The restored castle is now a museum featuring archaeological finds and artifacts from the era the castle was in use. Poenari Castle ruins are located near the town of Targoviste and are sometimes referred to as Vlad Tepes' palace. In fact, Vlad Tepes did have Poenari Castle reconstructed from older ruins during his reign. The structure then served as a fortress for the infamous ​King, known later as the Impaler. To reach Poenari Castle, it is necessary for visitors to climb almost 1500 steps; this trip is only for the fit and enthusiastic! However, for fans of the Dracula legend, it may be well worth it. It's possible to survey the surrounding land from the height of the castle's outcropping and imagine how Vlad III would have seen it as he protected his domain and ruled his territory. Suceava Fortress dates from the 14th century and is located in the Bucovina region of Moldavia. This strong citadel successfully fended off attacks from Ottoman invaders during the height of its use. Suceava Fortress is accessible from the town of Suceava and makes a good addition to other worthwhile sites in the Bucovina area, including the UNESCO-protected painted monasteries. Coltesti Fortress, now in ruins, was a 13th-century castle located in the Trascau Mountains of Romania. The castle was rebuilt and destroyed several times over the course of time. Rasnov Castle is a 14th-century fortress built by Teutonic Knights to withstand invasion from Turks and Tartars. More a fortified village than a military outpost, Rasnov was built to protect common people from attacks and contained everything a small community of village people would need in order to survive a long siege. Rasnov Castle was used for various purposes in the following centuries, undergoing several periods of reconstruction. The castle is located in Romania's Brasov County. Built at the beginning of the 14th century, the Enisala Castle fortress is located in Romania's Tulcea County. Neamt Citadel, also known as Neamt Castle or Neamt Fortress, is located in Targu Neamt, in the northern part of Romania. It dates back to the 14th century. Kendeffy Castle, also known as Santamaria Orlea Castle, is located in Hunedoara County. Though the original castle on this site dates from the Middle Ages, the current castle exhibits Baroque details. It now serves as an inn.